Fall is officially in the air. I might just feel like that because the last two nights, riding my bicycle home, the air has been almost chilly. Well, tonight it’s 80 degrees, but that’s chilly after the last few months of sweaty heat. 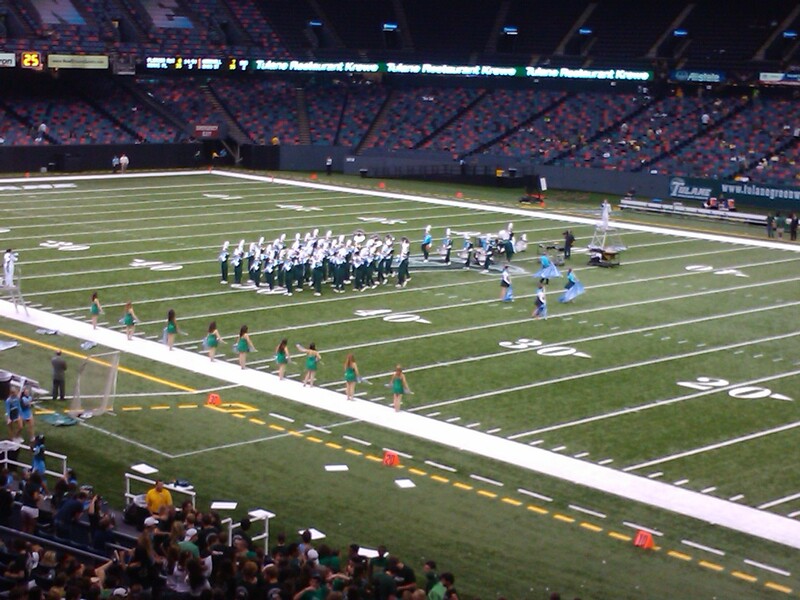 Fall means football season, and tonight I took the bike down to the Superdome for Tulane’s first game of the season, against the Lions of Southeastern Louisiana State. Also playing tonight? The Saints, in their final preseason game. There’s no way Tulane fans are going to fill the Superdome, on a night like this, especially playing a Division I-AA team. The place was virtually empty, but that didn’t means we didn’t go through all the proper motions of a football game–cheerleaders, dance team, color guard, marching band, fight songs, that other song, and–oh, right–some football. I snapped this picture at halftime as the band played, the flaggers waved, and the dancing girls awaited their big entrance. Just a couple weeks ago I watched them practice on an empty campus. But now, it’s on. But come on, Superdome. Get some bike racks! We’ll need them for all the action you’re about to give us. This entry was posted in sports, weather and tagged CBD, fall, football, New Orleans, Southeastern Louisiana, Tulane. Bookmark the permalink. Hope you enjoyed the game AND the win!! Thanks for the shout out to cheerleading! I guess this is where I should say… Roll Wave Roll!! Hi, Chloe! Y’all looked great! And yes…Roll Wave Roll. We had fun and are so glad you came to the game. Roll Wave Roll!! !